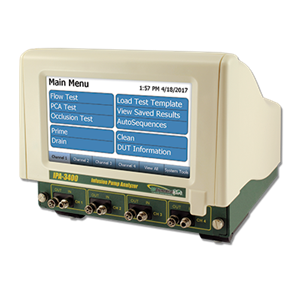 The IPA-3400 is the most compact, full featured four channel analyzer on the market. It is a high accuracy, easy to use system that incorporates full touch screen control of all processes without the use of old fashioned buttons and knobs. This new cutting edge, Patented design uses a dual syringe stepper motor driven system that provides continuous monitoring of the fluid flow without the need to stop and perform intermittent drains like older technologies do. This provides a more realistic flow path for the Infusion Device under test and therefore more accurate readings. Also, independent stepper motor control of the custom designed ceramic valving allows the system to run not only more quietly and more smoothly, but it also allows for a bidirectional powered fluid flow for use in the built-in cleaning cycle. View a sample print out of an autosquence report. 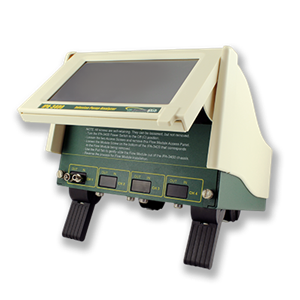 The IPA-3400 has built-in auto-sequence capabilities that allows the user to perform automatic test procedures. This allows specific test routines specified by various manufacturers to be run, which provides a significant time savings as well as reduces the risk of human error. Advanced features in our auto-sequences even allows the inclusion of pictures to aid with the setup and configuration of each step. All test results are stored internally in the large 32 GB memory. They can also be downloaded to a USB flash drive or directly to a PC. There are specific requirements in IEC 60601-2-24 for not only flow readings but back pressure simulation, bolus (PCA) measurements and occlusion alarm monitoring. All of these features are specifically built into the IPA-3400 with simple to use on screen selections. 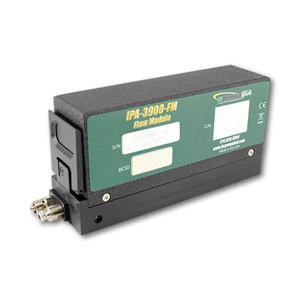 The IPA-3400 is designed to hold up to 4 IPA-3900-FM flow modules. These modules are individually serialized and calibrated so that they may be moved from channel to channel and even unit to unit. Once installed they are recognized by the IPA-3400 and their Serial Number and NIST Traceable Calibration information are presented on the display and utilized in all data reporting. The interchangeable modules provide the user with unprecedented flexibility in their IPA Testing System. There is no need to be down when the unit is due for calibration. Only the modules need to be calibrated. This also allows the rotating of modules or the use of a spare module, thus providing flexibility not available in other systems. The same is true for service. If there is a problem on one channel, only the module needs to be serviced, eliminating downtime. The IPA-3400 display may be raised to gain full access to the four user swappable flow modules. No wiring or plumbing is required for module installation. Simply lift the display, remove the cover plate, loosen the retainer screw and slide the module out. All plumbing and electronics are self-contained and all electrical connections are made via a slide-in mating connector on the end of the module. Then just reverse the process for installation. The IPA-3400 allows for easy field expansion. You can buy a 1 channel unit and later purchase additional modules that can be added in the field. Just plug them in and the system will automatically recognize the additional module(s), reconfigure itself and you are ready to go. PLEASE NOTE: If you have the old IPA-3400 software installed, you must uninstall the old software before installing the new BC Flow Software.